The fashion world is changing as quickly for men as it is for women. Each year the leaders in the fashion industry throw new styles and trends that become talk of the town. If you are a fashion geek, you must have known the pain of having to quickly update your wardrobe. From suits to shoes to accessories, you need to update them all. A pair of Grenson’s: Grenson’s shoes are quite fashionable. Made up of Scottish high quality leather these shoes are among the top favorite for 2017. These Grenson’s are a pure timeless choice. You will find them in trending wear for each year with slight modifications. Perfect for university students, for partially formal gatherings. The hard worker’s shoes: The hard worker’s shoes are the “Alden of New England” laced, high heel shoes. These shoes have a simple design and stitching on them. But finely made to give you a graceful look. Good for corporate as well as for semi-formal days. Crocket and Jones: The handmade Crocket and Jones shoes are the pure “dress to impress” thing. Fine quality and laced. A great style addition for adding elegance to your style. Good for managers or for people in the lead. Also for elderly people who like to maintain their own class. Rugged Timberlands: These rugged timberland’s is the new trending thing for people who are out most part of their days. Rugged but comfortable at the same tip. Topping the look with the beautiful Timberland logo on the sides. These are also laced and high heeled. The Sturdy Trickers: A practical pair of shoes for the most stressful days. Traditional in look but uniquely made to give you a custom style. Equally good for corporate as well as for casual. The Clarks for Deserts: These patchy styled Clark shoes are literally designed for Deserts. Very minimal in design but high quality finish. This suede leather will add so much to your character. But wait! You can wear these off the desert too. The Motorbiker’s Belstaff: Oh Damn! These are the perfect motorbiker’s shoes. No wonder all girls will be after you. Perfect for boys who specifically like to motorbike. You can also wear them to match on costume parties. This one is a little funky pick. 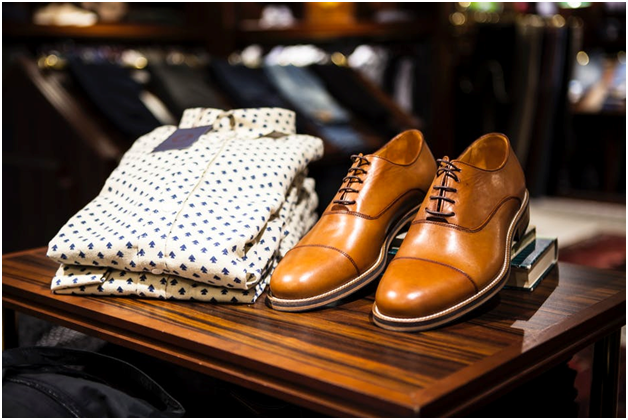 The Shanghai Style: Shanghai Style Men’s shoes emerged for the first time in 1929 but still rock the men shoes industry. These are not laced and different from the previous ones. Will rock your look in semi-formal events. The Wolverines: Wolverines are made of high heels and leather. This wolverine is best suited for men who want to look the hardest around. These shoes are guaranteed to be your partner for all hard days. Put these on if you are travelling or going out for long. Enjoy big miles with these! The Australian UGG: These trending signature shoes by UGG should be your pick for adventurous days. They have a classic sheepskin style and are mostly worn in winters. Give you the ultimate warm feeling and look.